Project Cloak, an experimental tool by Adobe Research, offers an innovative way to remove unwanted objects from a video. Object removal is a huge pain point for visual effects artists, who currently spend countless hours manually erasing boom-microphones, special effect wires, distracting objects, and more. For videos where the region behind the object is never seen, the system employs Adobe’s content-aware-fill to guess what is missing. Ultimately, the algorithm figures out how to replace the unwanted pixels with new ones that best match the appearance of the scene. In the Adobe MAX Sneak presented by Adobe Research’s Geoffrey Oxholm, a tall lamppost was effectively removed, then a backpack strap, and then whole people as they walked across the screen, eliciting an awed response from the audience. “Cloak marries dense tracking with pixel replacement,” explains Oxholm, a research engineer at Adobe Research. This work originated with the groundbreaking 2004 PhD thesis of Eli Shechtman, now a principal scientist with the group. For this new application to make it into the hands of artists, there’s more to be done. “It’s late breaking research—we are gathering more data now,” Oxholm says. The team hopes that someday, this approach could help “democratize” elements of video editing that are currently extremely time- and money-consuming, opening up new avenues for creativity outside of high-end studios. 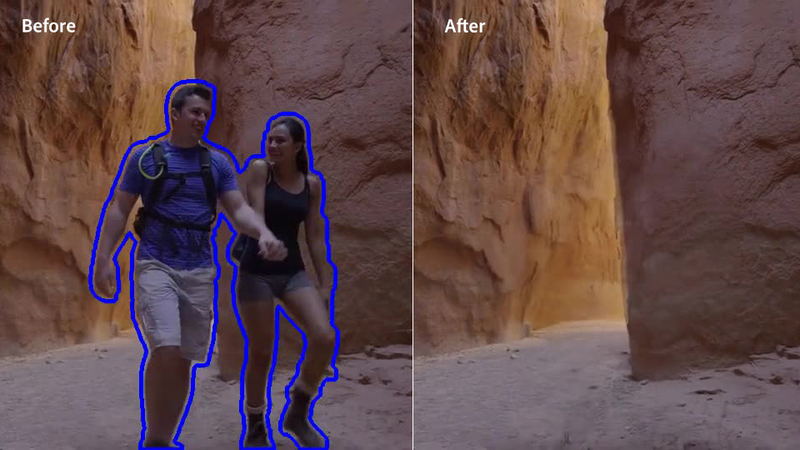 Before Cloak, two people walk through a canyon in this video still. The user selects the people and Cloak removes them, filling in realistic canyon walls in their place. Interested in more background on this project? Read the Adobe Blog post.